I’d sipped my daypack ahead to Albergue Espiritu Santu in Carrion, so after “second Breakfast,” I went off to find it. I was thinking of treating myself to a night at the 4 star hotel San Zoillo, in a former monastery at the edge of town. But when I found the Albergue, I decided to stay. It’s in a former parochial school, and run by nuns. They’re a different order than the singing nuns that run Albergue Santa Maria. I rang the buzzer and Sr. Maria Antonia let me in. She was dressed in street clothes, and like many Spanish people over 65 she was less than 5 ft tall. She had a warm, authoritative way. “Yes, they had my mochilla pequena. Did I want to stay?” I was a little skittish about Albergue life after my Fromista experience, but Sr. put me at ease and the price was right: 5€! She took my passport and credential as usual, but asked first if I was de Alemania, or German, like everyone does. I asked her about the convent and if there were many sisters in residence. She said there were just s few, in their 80’s and 90’s. There was not a shared vesper service as far as I could tell. Then she gave me a thorough tour of the campus and was very clear that the door was Cerrado! at 10:00. Yes! Comprendo! She showed me all the statues of Mary and then the Pilgrims’ meditation room/chapel and sleeping rooms upstairs. Camas, not bunk beds! Best of all, there was excellent wi-fi everywhere! I thanked her and settled in. It turned out that Tsmmi had already checked in and had the bed next to me. Pilgrims were sunning themselves while their laundry dried in the warm corner of the former playground. There was a nicely equipped kitchen, and I decided to go buy some groceries and have salad for dinner. When I came back a young guy from Ashland, Oregon was organizing a dinner party so I added my salad to the mix. There were many cooks in the kitchen: French, Swiss, German, and a young woman from Seattle. They were all the age of my kids. Vino Tinto was poured as we cooked, and multiple languages ricocheted around the tight kitchen. Sr. Maria-Antonia came in and reminded everyone that they needed to be quiet and in bed at 10:00. Everyone nodded politely and thanked her. These young pilgrims were walking 30k a day, and they were tired by 10:00. 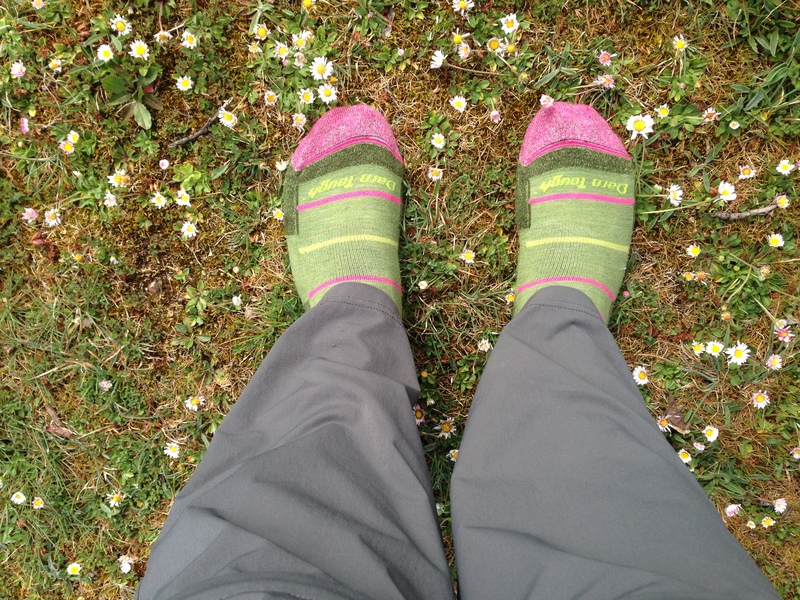 The Oregon State student was walking the Camino in flip-flops. I guess you can do that when you’re 18! I had arranged to walk around Carrion at 7:00 with Tammi, so I broke bread with the young-uns and then let them continue, which was fine because I felt slightly old. Later, at 10:00, we were getting ready for lights out and Sr. Maria-Antonia came in with another Sister and said “Buenas Noches” to each one of us. I got a hug. 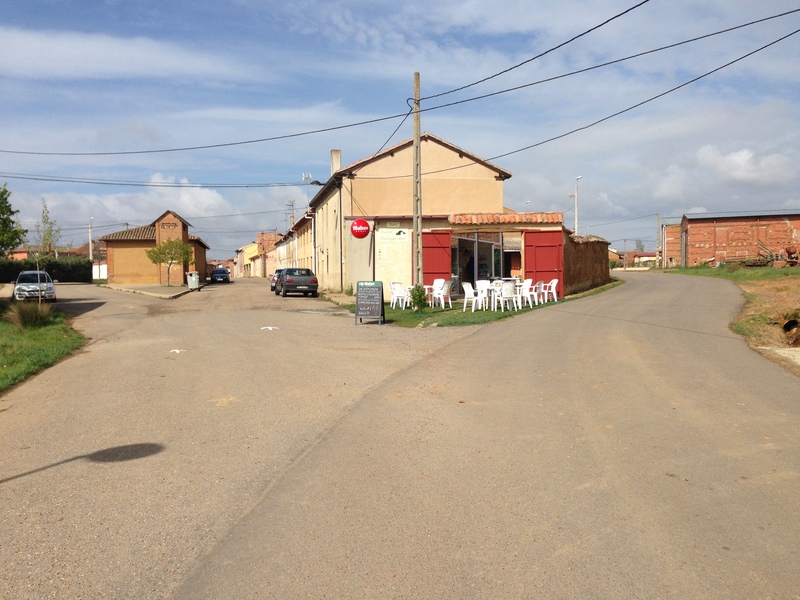 Carrion was the other place I’d stayed on my “bus tour” through the Meseta in 2013, and like Fromista, I looked forward to seeing it again now, from a new perspective. at the entrance to town via taxi. I made it one block to the plaza Santa Maria by the Albergue Santa Maria, run by the nuns, and waited for it to open at noon. I didn’t see much more of Carrion than that little area. When Gina and Kai arrived, I had dinner with them, and hobbled back to the church for the pilgrim concert, Mass, and blessing. That was one of my most treasured memories of Camino 1.0. Gina and I went to the Mass and Pilgrims blessing in Roncevalles at the very beginning of the Camino, and also shared the experience in Carrion. The nuns made little paper stars for the pilgrims, and the priest laid hands on each of us individually. There were tears, sweet tears. The next day I hobbled to the bar/bus station and bussed to Leon. There were lots of other injured pilgrims, so I felt ok about going on. But I was beginning to realize that my injury was not going to disappear anytime soon. Fast forward to 2015. I set out on the short 6k leg to Carrion after the cafe at the Albergue opened at 8:00. I met up with Tami on the road, and we visited as we approached town. We arrived in no time, and stopped at the Cafe Espana, which doubles as the bus station. It brought back memories from 2013. 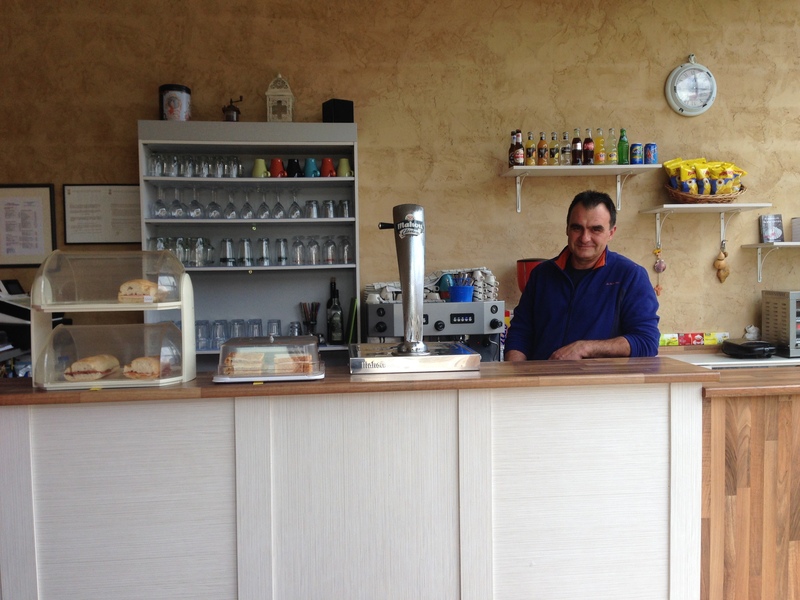 The same nice guy was behind the bar selling bus tickets, beer, and making espresso. The same eclectic mix of Pilgrims, old men playing cards, and policemen were there, drinking coffee, and fresh-squeezed orange juice. As Tami and I sat down for “second breakfast,” one of her Camino friends came in. She was Australian, about my age, and she was very friendly. 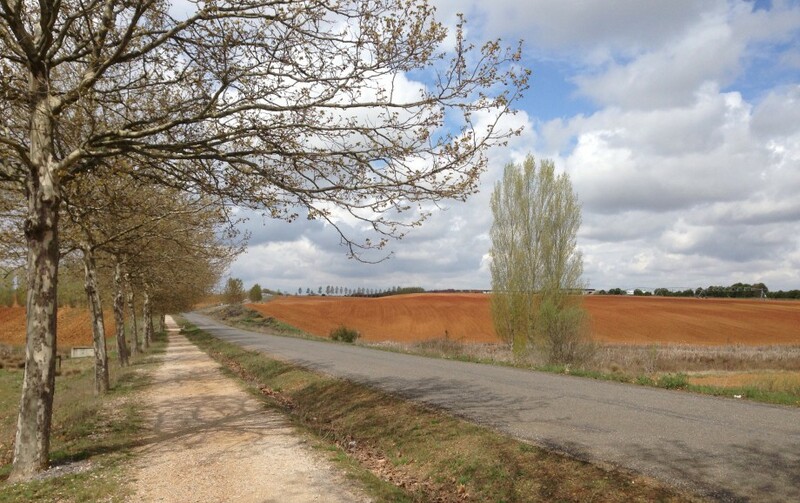 She told us her amazing Camino experience from the night before. She was the only one staying at an Albergue out in the country, and she and the Dutch man who worked there had a long, soulful conversation. He told her that he had been asked to be a sperm donor for a lesbian couple in Holland who were friends with his grown daughter, and now the boy is 4 and calls him father, and the Dutch man’s life has been opened up to a whole new phase by becoming a member of this unexpected extended family. She was teary because back in Australia her 27 year old son had just come out as gay, and she despaired that he would never be a father. But her evening with the guy at the Albergue opened her heart and mind to new possibilities, and that gay couples could have kids, and that her son could be a father. She marveled that it felt like she was supposed to be there, and that no one else was staying there, so she had the time to talk all evening with the Dutch guy. 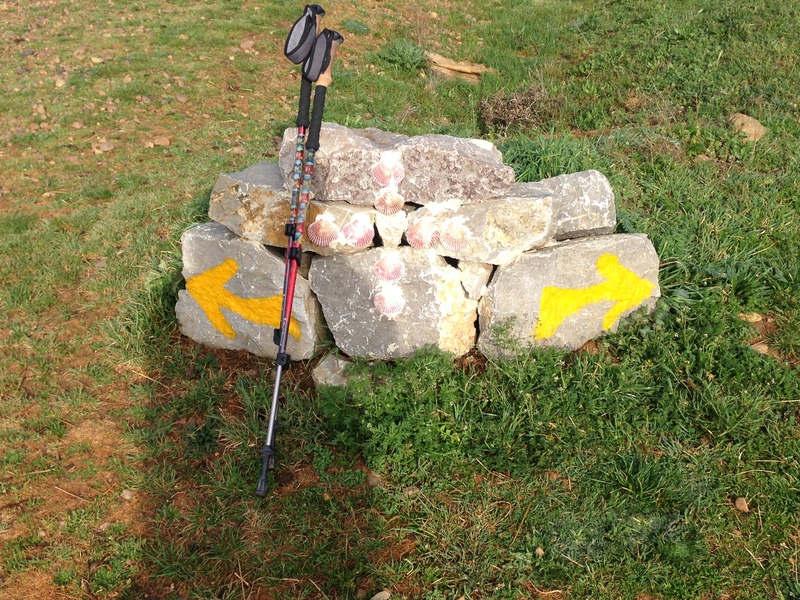 That’s the magic of the Camino sometimes. It seems like there are many synchronicity, or maybe as tired Pilgrims, we are more open, and God has an easier time reaching us. Then I started crying, too, after sharing that our daughter is the same age, gay, and that I’d had similar feelings, but now had faith that all would work out. 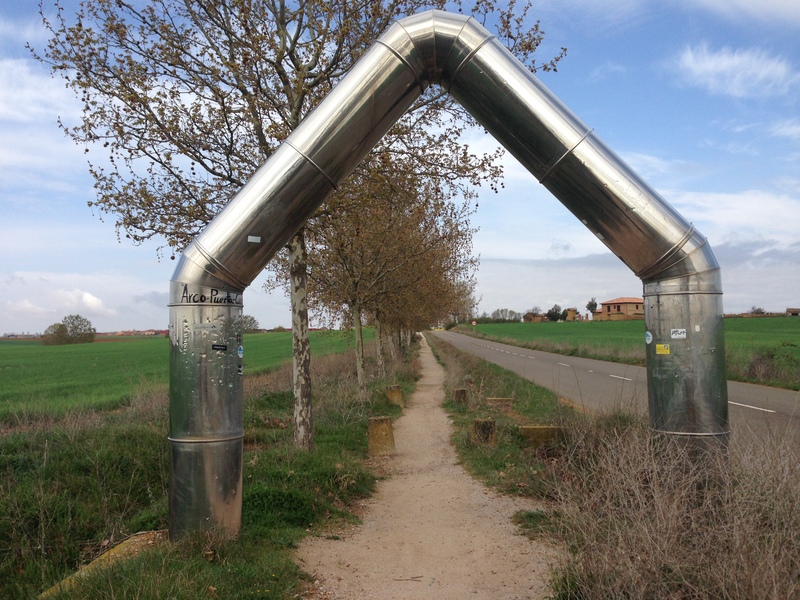 We laughed and hugged as Moms and Pilgrims, and that was a Camino moment, too. Dawn finally came at the Albergue and I packed up. The poor woman who had snored so badly looked terrible. I felt bad having been upset with her during the night. It sounded like she was going home. I felt for her, knowing what it is like to have to cut short your Camino. Nancy from New Brunswick and I walked down to the plaza by San Martin where we found the best cafe/bar. It turns out that she is a French teacher and is Acadian. She did a year’s exchange as a teacher in Louisiana! She lived in Brobridge and taught in Cecilia. Of course she knew Alexandria! She was going to taxi from Fromista to Villacazar de Sirga to meet her husband and friends. I took off and thought I might stop there, too, or go onto Carrion. The way out of Frimista took me over the Autovia, and then next to the two lane highway on what’s called the senda, a specially constructed gravelly pathway. I asked if there was a cafe in town and they said no. A vivacious young woman came in with some snacks for the artists and she offered me some. We talked a little more, and I must have looked quite tired and hungry because she said in rapid-fire Spanish, “I’m taking you home for lunch!” She took me by the arm and we walked about a block to a small square where she opened the door to a large home and took me into the kitchen, pulled out the table and sat me down with two of the most adorable little girls, who were painting Easter Eggs. Of course, their eyes got very big when they saw this complete stranger in hiking gear plop down next to them! We chatted in very broken English and Spanish for about an hour. She has a sister who lives in Atlanta. I pinched myself to make myself realize it was real. It was so wonderful. The house was over 300 years old, she said, and the family crest was carved into the stone on the front of the house. She gave me a quick tour of the downstairs, pointing out the taxidermies of a fox on the landing and a wild boar with its hooves also mounted, that her grandfather had shot. It was a glimpse into another way of life, and at the same time, the large staircase reminded me of home. Macha, Julia and Isabel walked me back to the Camino and Macha kissed me on both cheeks as we said good-bye, as Manuel, my seat mate on the flight to Madrid had done when we reached the baggage claim. After my run-in with Mr. Albergue, my time with them was such a gift and a blessing! I walked onto the next village and filled up my water bottles (the visit had been so exciting, I’d forgotten to ask) and met Tammy, a fellow Pilgrim from Texas. We walked and talked for 10k and decided to stop in Villacazar. When we walked into town, there was Nancy and her group, and we checked into the same Albergue! They were so nice. We toured the large church together and ate dinner together at the Albergue. And I had a good eight hours’ sleep.